Tower House, Dragon, and Floating Island by Mort1984. 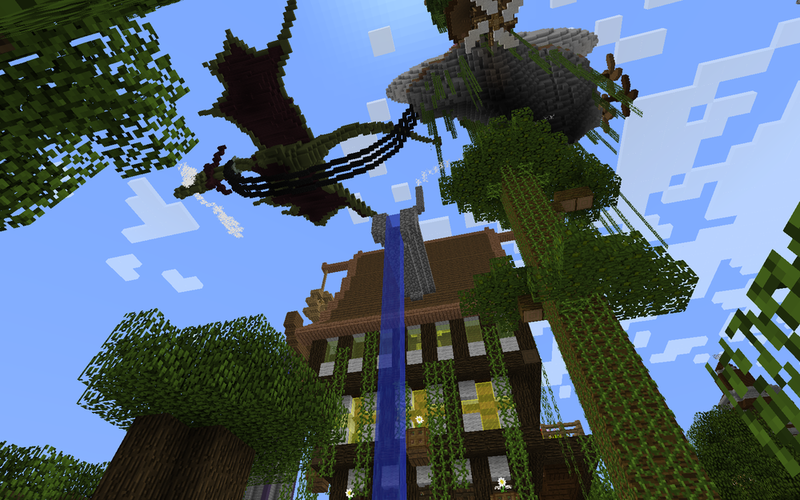 There are many aspects to Minecraft that make it appealing to such a wide audience. It taps into many areas that most other games don't bother with. The biggest aspect of Minecraft that I think is the major reason it became so popular and continues to sell copy after copy is player creativity. 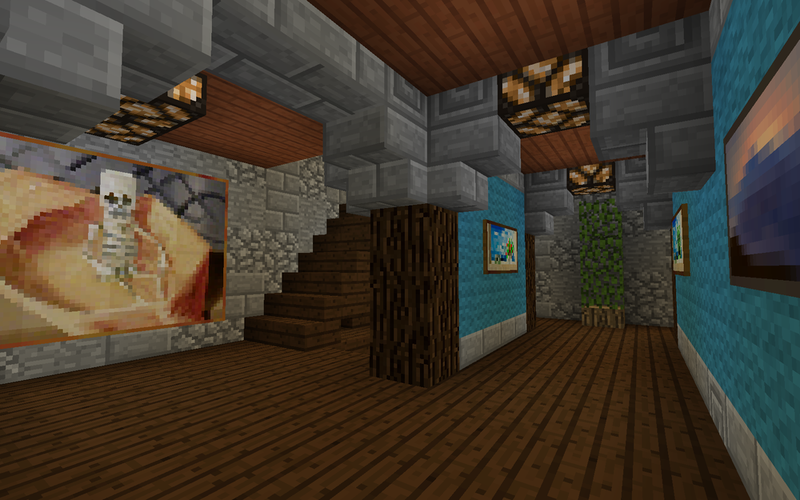 Minecraft allows and encourages players to tap into their creative sides in many different ways. For those looking at Minecraft from the outside, the easiest comparison to make is that "it's like Legos". Boiling it down to the most basic, Minecraft is definitely a game with blocks that you place on other blocks to make things. While Minecraft has a lot more to offer than just this simple task once you really dig into it (pun definitely intended), it also informs or influences just about everything you do in the game. For now, however, I am going to focus our discussion on the thing Minecraft does that is most like Legos: building in creative mode. When starting up Minecraft, you have a very basic choice for how you want to play: Survival mode or Creative Mode. Survival is the mode where you start with nothing and must find and collect resources to survive. Everything that you have is earned. Creative mode is just like it sounds, a mode in which every single block is available in infinite amounts where you can create anything you wish, just for the joy of making something. Creative mode is pretty much like having a box with every single type of Lego block in it. The possibilities are endless, and sometimes daunting when you can literally make whatever you want. Getting started is often the most difficult part of any build, even once you've decided what to make. Building in creative mode is a much different experience to building in survival. Building in survival is often dictated by what supplies you have on hand and how much of them you have. If you lack a certain item that you'd like to use you either have to go out and find it or decide to go without using that particular piece. Having every block available to you in creative mode leads to a much more iterative process where you keep noodling on something until you like what you have. Don't like a particular block type? Switch it out. Want more detail on that plain-looking wall? Try adding several different things until you find something that works. Getting started can be difficult, but once you've got something more than a blank canvas, it is easy to get lost in the creative process. There's always another block to place, another detail to add, or another feature to construct. Small ideas spark larger ones, and before you know it, the small project you started on has bloomed into something much more ambitious. 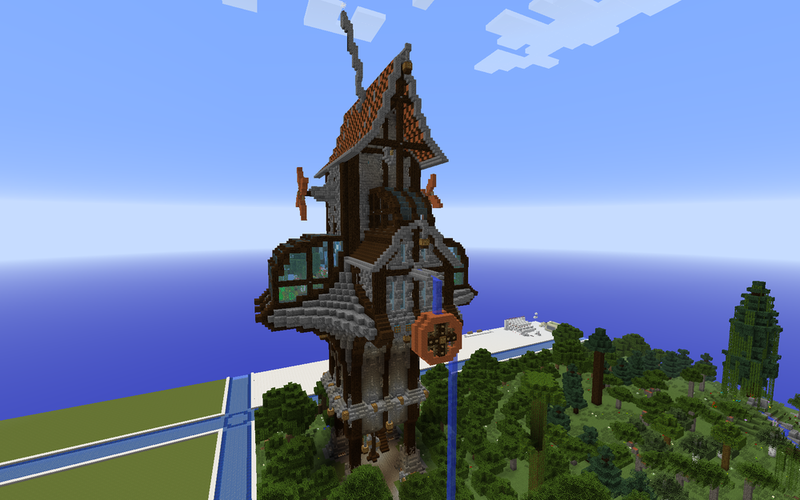 Two Steampunk Tower Houses Built by Mort1984. 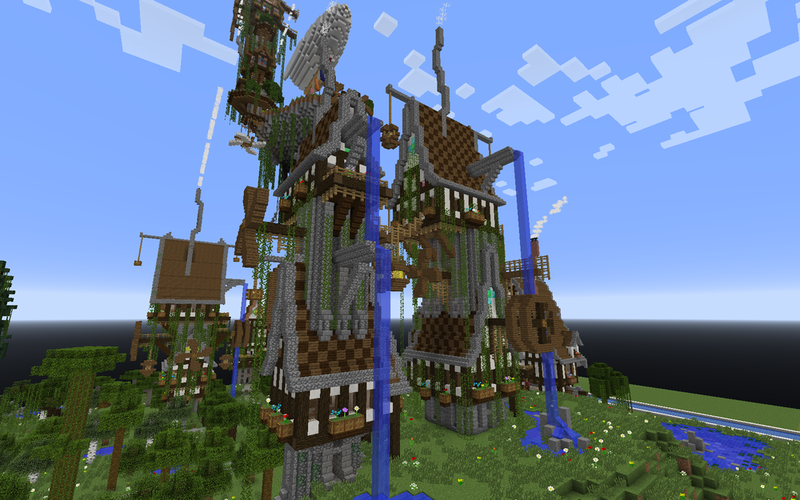 Recently, a friend of mine (who goes by Mort1984 in Minecraft) had started building a sort of steampunk village on the XPD Plotworld Creative server. He invited a few people, including myself, to build something on his plot (a large 200x200 area) as long as whatever we made fit in with the steampunk theme of all the existing structures. I started by doing a couple of small things off to the side and decorating the interior of one of Mort's existing houses. I wanted to make something bigger, but I had no idea where to start. 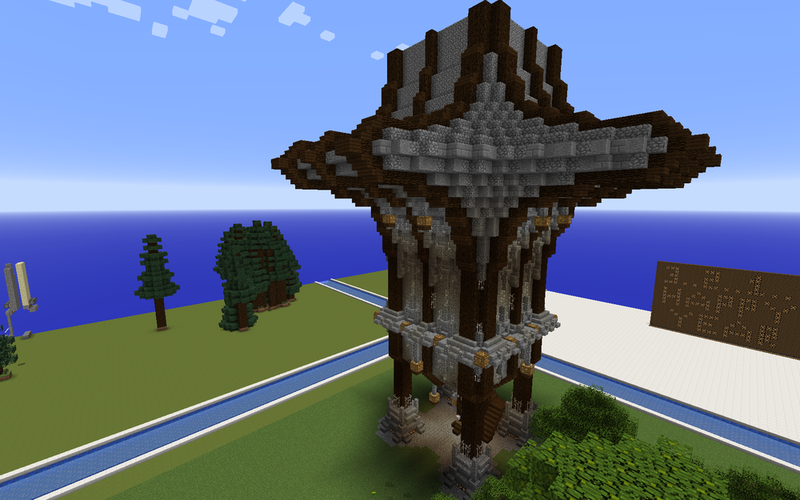 After a couple times visiting the server, I decided to just start building something without any plan more than "I'm going to make a tower thing". I placed a few blocks on the ground. Then I placed a few more. After a few minutes, I had the beginnings of something started. I had no idea where it would go. I had no idea what this building would look like in the end. The important part was I had gotten the ball rolling. What started as a few large columns and a staircase quickly turned into a larger building with a curved archway on the top. After experimenting with a different shape, I ended up mirroring the same curve on top of itself to make rounded spikey shapes poking out from the main building. I didn't like the solid stone walls, so I went back and randomly replaced blocks with stone blocks of various textures. I still didn't like how plain the walls looked, so I started experimenting with "fiddly bits" to fill them out. I added hanging lights to parts of the building. I added details to the base of the columns. I kept myself busy for a while with details on the existing build, but I knew I eventually had to continue building upwards. I tried several ideas for a roof, including a terrible attempt at a Chinese temple style, without finding anything I liked. It was at this point that I asked my friend Mort for help. He built a simple shape outline on top of the curved section of my tower, and it sparked an idea for me. I had spent hours banging my head against a wall, and all it took was a small spark of an idea from my friend to get things moving again. Soon I had a small roofed section added to either side of my tower, and two greenhouse areas soon filled out the other two sides. A large curved roof on the main part of the followed, and I suddenly had several more areas in which to add small details. In order to break up the symmetry a bit and help my tower to fit in with the plot's overall theme, I added a few features from existing buildings such as propellers and a water wheel. These really helped to make my building feel like it belongs with the rest, even though I used completely different materials than what was used for other structures. I am still working one this particular building. I am satisfied with the exterior at this point, but it is little more than a pretty shell. I want the interior to be just as impressive. I've added several rooms to the base section, but there is still a lot of space to fill. Not to mention I need to get an interior decorator to fill all those empty rooms with furniture and decoration before I can really call this project "finished". 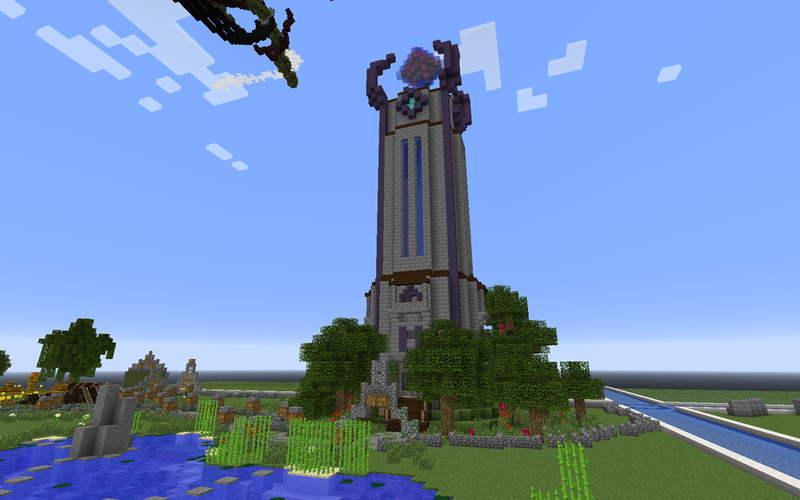 This is the beauty of building something in Minecraft without an exact plan in mind. The builder can be just as excited to see how things take shape and where things end up as any outside observer. There are times when you are building that you get really excited because the piece you are currently working on feels "right" and makes everything you've already done look that much better. There are times when you think "I would never have predicted this is how things would look when I started". If there is any single tip I can give on how to be a good builder in Minecraft, it is this: don't give up too early. Sometimes making something you don't like and tearing it down can be just as important as making something great right off the bat. If you aren't afraid to experiment, fail and start again, then you will most often find that your structures become a lot more creative and interesting in the end.